Welcome to SagetoSuMMit Running Club! Why do you run? An excellent form of exercise. Competition. To stay at the top of your game. Weight loss. Better moods. The high you get when you reach your goal. To get away! Running for me is a passion. I enjoy it. And I want you to experience that too. Running to the power of two. Motivation from aside. Join our group and experience motivation in numbers! We can all benefit each other. All ages are welcome, all levels are welcome. Men and women, running strollers, whatever your reason to run, let's do it together! Fantastic BABYSITTERS provided on occasion! 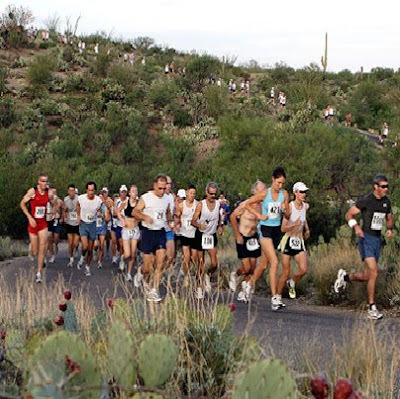 Enjoy race discounts and sports store discounts. We'll keep you informed about upcoming races and set goals together. We'll send out regular emails with running dates, times and locations. $20 annual membership gets you an awesome shirt! Or buy an ultralight microfiber moisture management shirt for $15 more. See below for sign up information. These shirts are for both club members and non-club members. You can pick up this new totally awesome T-Shirt for $10 buckaroos. I won't promise that the shirt will help you run a 4 minute mile, but you'll sure look good doing it. Sport the shirt that lets everyone know you run...FAST! Spring is here...kind of. We want to start our club runs as soon as it starts to warm up. Be looking for an update as to when our club runs will be held this Spring and Summer. Join the Facebook group "Why Mark Mendoza should be Race Director for Ragnar Relay..."
New T-Shirts have been done up and they look awesome! For those of you who haven't gotten your shirt from last year please send me an e-mail and we will make sure you get that. Common Ground, a non-profit group. They do outdoor recreation for people with disabilities. He asked me to help spread the word about their upcoming race. They will be having a mile, 5k and 10k run (as a fundraiser) on Saturday, April 11th, at 9:00 AM. www.cgadventures.org/race-for-ability.php or call 713 0288. Here's what Nate told us about his running career "I don't really have much of a running past. I started running about two years ago with my first half-marathon (Top of Utah). Last year I ran a 10K and the half-marathon again. This year I've been running a bit more. I started out by running in the Ragnar Wasatch Back Relay (Leg 6), Smithfield 5K, Freedom Run (15K), and the half marathon again. That's all the races that I can think of right now. I am planning to run my 1st Marathon in St. George in October. This may also be my last marathon. I think I like the half-marathon distance better. I may also try to find a 10K to run just to complete the gammit this year. I will be cutting back on my training next year because I am a little burned out this year. I run because it feels good (when I'm done), and it is also a good chance to get away. I really enjoy training for and accomplishing race goals. It is also excellent exercise so I have an excuse to eat whatever I want. This is about all I can think of right now." 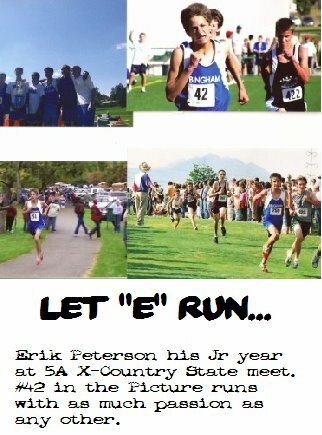 We are proud to sponser Erik Peterson. Well, what can I say? I love to run! Otherwise I wouldn't have started this sweet running club. My name is Mark and my friends call me DOZER. I have been running since I was 13 years old, so for about 16 years now. I grew up in California where I started my running. I have run in the smallest of races to the biggest of races. I have run in six different states and have run race distances from one mile to half marathons. I did some X-Country coaching at Brighton High School & I currently coach wrestling at Logan High School, so coaching is very familiar to me. If you ever have any questions about running I'm sure I could answer them for you. I hope you join our team & can improve with us. What is the best time for you to run? What distance do you like to run? Running club, running, run, jogging, walking, weight loss, Sage to summit, sagetosummit, sports, logan, cache county, Nibley, Cache Valley, Logan, Utah, Millville, Mendon, North Logan, Providence, work out, Hyrum, River Heights, Smithfield, sun n snow running club, sun and snow running club, top of utah marathon, mammoth marathon, x-country, cross country, track, Logan High School, Utah Running Club, runs, diet, exercise, mark mendoza, Ragnar Relay, Race, races, fast, speed, pace calculator, running shoes, running clothes, marathon, 5K, 10K, miles, mile marker, racing, Top of Utah Marathon, TOU.